“The most detailed analysis we have to date on why young people voted as they did” (from the foreword by Dr Manmit Bhambra, LSE European Institute’s Generation Brexit project lead). 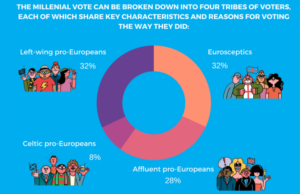 This IF report identifies four different “tribes” of Millennial voters in the EU Referendum. The multi-faceted analysis, which uses latent class analysis to segment the Millennial voting group, gives detailed insight into why Millennials overwhelmingly voted Remain, and what each of the four groups identified want from Brexit negotiations.